Four flintlock pistols and a sword at his hip keep this pirate ready for anything! He rests a foot on a skull as he drinks, not noticing the the octopus tentacle reaching out for him. This stein holds 22 ounces, and we make it by hand from lead-free pewter. 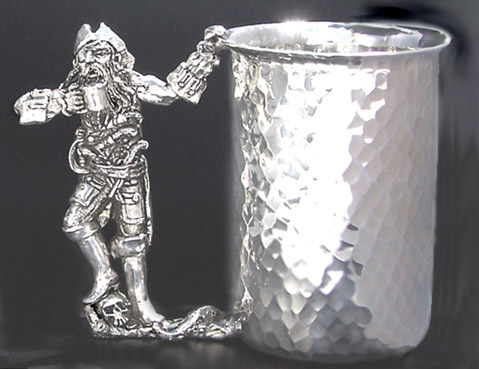 * As a companion piece, go to our "Pewter Cups" and our Pirate Girl! They're made for each other! !